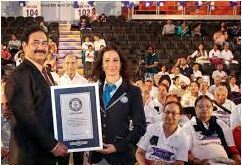 STORY: 200 joint replacement surgery patients assembled in India’s capital, New Delhi to set a Guinness World Record for the largest gathering of such patients in the world on Sunday (April 08) under surgeon Anil Arora. Professor Anil Arora, a surgeon who runs his own clinic on knee and hip replacement in New Delhi established this record for gathering the largest number of patients operated by one single surgeon. Joint replacement is surgical removal of a damaged joint from a person and replacing it with a new non-damaged functional joint. A programme called ‘CARE- Continuing Awareness, Research and Education’ on joint replacement was also organized for the patients at the stadium to educate people about the advancement in this field and to remove all kinds of myths and complications prevailed about joint replacement surgery. New technology, implants and techniques have now made it possible for people with joint problems to get it replaced with a functional one. A consistent follow up and care of the joint can allow a patient to live with it for more than three decades. In India, knee, leg and hip are the most common joint problems among people above the age of sixty.